I thought I would check in today and give you an update on my sampler quilt, you may have read my previous post where I was in a bit of a quandary as to whether I would hand or machine quilt it? Well, the the results came back from you all that I should hand quilt it, and that I did! Just recently I received stock of some great quilting stencils, they are plastic templates with designs cut into them that you can just draw around and then stitch over the top! You can use them for hand or machine quilting, so for this project I've picked out a couple of traditional floral designs and been stitching these into some random blocks along with some straight line stitching to mix things up. You can purchase these in my shop here! I would also thoroughly recommend the use of a quilting hoop, this really has been a life saver and helped me to keep my stitches even. The stitching above was my first block :| it's amazing how quickly you can improve after a little practice! wow that is looking gooood ! i had been eyeing the stencils, dithering, but i intend to take the plunge now i've seen how they look.... i have always made my own 'til now, basically a heart shape cut out of card in various sizes and i was getting bored with that ! hopefully the new fabric will be in soon and i will buy them all together ! i cannot wait ! don't suppose you can give us a teensy little lesson in freezer paper too? i see it mentioned on US blogs but have no real idea what to do with it. Am i the only one ?? It's coming along so beautifully! And it will mean so much more to you after the investment of hours in the hand quilting. 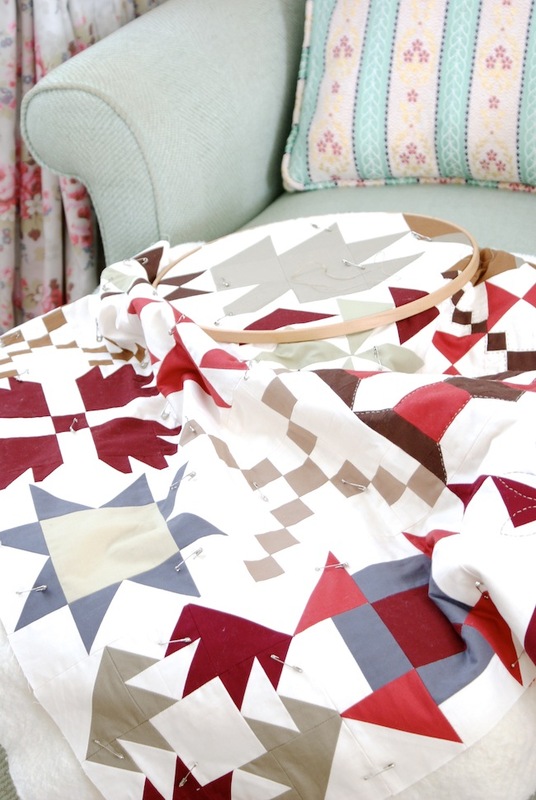 There's just something extra special about hand quilting. Your quilt is so soothing and calm! Oh J! It is just perfect :-) I'm so pleased you did decide to hand quilt it, your stitching is lovely too. I couldn't get on with a hoop atall, too cumbersome for my liking! Beautiful, so stylish and a wonderful mix of bold and new as well as traditional and timeless! Your hand quilting makes it so interesting and varied too. Wow, your hand stitching is amazing! 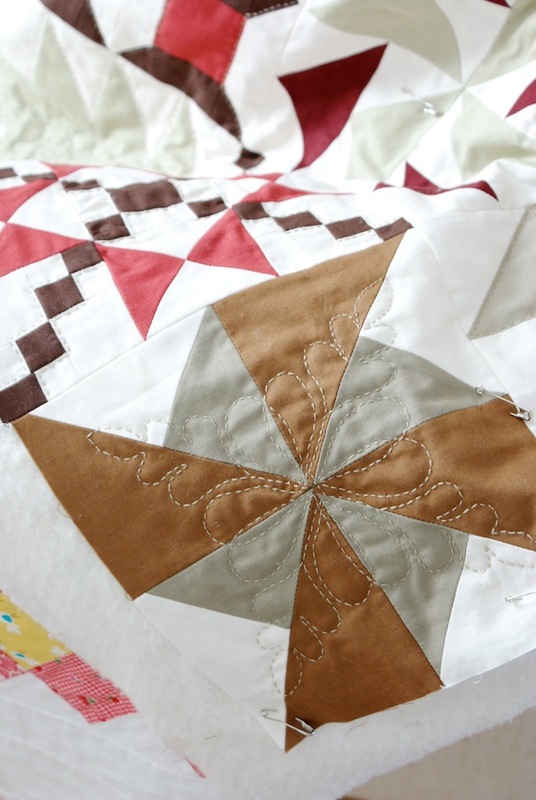 I love the idea of the templates too, what a wonderful way to enhance the quilt. It will be perfect for those Autumn evenings.